Ever want to know how to pronounce an unfamiliar word? A person’s name, a place name or even a regular noun? Ideally, we want our reporting to reflect keen research and familiarity in all aspects of the story, including pronunciation. Mispronouncing a key word in the script can make the speaker sound uninformed, even if all of the other information is well reported! It is worth spending the time to research correct pronunciation, or at least to formulate an educated best guess. NPR’s pronunciation guidance for people’s names is simple: go with the primary source if at all possible and pronounce an individual’s name the way they themselves pronounce it. Look for video or audio of a person online. Listen to them say their name a few times, then write it out phonetically. 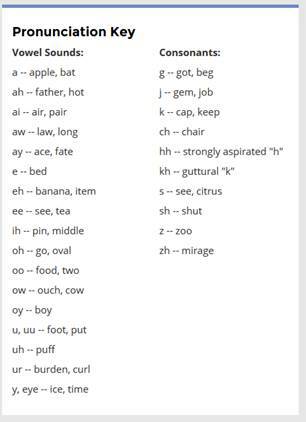 At NPR we use this guide (right) for writing phonetic pronouncers. Library of Congress Say How? If you can’t find a primary resource, reach out to a family member, representative or close associate and ask them for guidance. If it’s a geographical place name, we recommend pronouncing it the way residents of that place say it. Call the local library or city hall if you need help. If the place is outside of the U.S., contact their country’s Washington, D.C.-based embassy. We do not correct the pronunciations of interviewees, callers or foreign journalists who are heard in our stories. We also do not match their errors. Katie Daugert works with NPR’s Research, Archives and Data Strategy Team.